There are better ways to spend an evening than vegging out in front of the TV! Here are nine things to do with your evening that will cultivate your self and your relationships. These are good picks for adults or for families! After a full day of work, being mama to our babies, or obeying our to-do lists, 99% of us would prefer to veg out in the evenings rather than do anything else. And for 99% of us, “veg” means watching TV. Maybe not cable (we pride ourselves on being frugal, after all! ), but definitely Netflix. Or Hulu Plus. Or the latest stack of DVDs and miniseries we checked out from the library. But if every night (or even most nights), are TV night, I’m going to tell you straight up that you’re missing out. 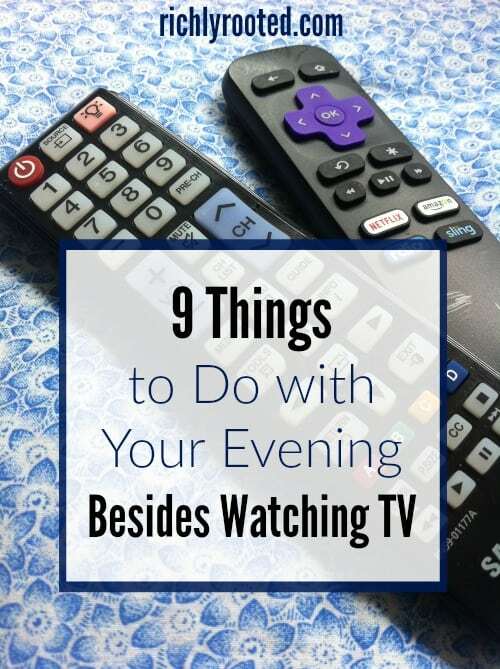 Because filling your precious leisure hours with TV is a narrow way to live. Do you think I’m being too harsh? I understand the draw of an engrossing story, and TV offers stories in a highly accessible way. I’m enthusiastic about my favourite TV shows! I fully attest that TV and movies can be a medium for art and a springboard for imagination and lively discussion. Yet something about this form of entertainment makes it too easy to be passive. After all, that’s why we often choose to watch a show in the first place! Lately I’ve rediscovered how a little reading goes a long way in enriching my life. Reading more made me realise how much I’ve been missing. In my diet, I would never eat just pizza, or any of my favourite things. I need variety, both for enjoyment and for health. I don’t want my leisure time to be full of “pizza,” the hours measured by how many episodes I’ve watched. Now, I know the biggest argument you probably have for watching TV is one that I’ve raised myself: you’re too tired to do anything else. If that’s true, then give yourself some grace and enjoy watching a show. But first try 20 minutes of a different activity. Or prove yourself wrong altogether and spend the whole evening TV-free. You’ll likely find that you have more energy than you think, and once you put in the initial effort you’ll be glad you did. Pretend like you live in a pre-television decade and crowd around the wireless for some evening entertainment. In other words, listen to an audio book or podcast! For podcast recommendations, check out this list from The Atlantic, or follow The Timbre blog for regular updates and podcast spotlights. Your library likely has a good selection of books on tape or CD, and many libraries allow you to check out and download audio book files via their online catalog. You can also get two free audiobooks when you sign up for a free 30-day trial with Amazon’s Audible. I understand that most of our brain juices are dried up by the time the clock hits 8:00 pm, so evenings might not be the best time to paint the next Mona Lisa. But you can still flex your creativity in some pleasant ways. I’ve taken up coloring recently, and I adore the intricate, whimsical coloring books by Scottish artist Johanna Basford. Currently she’s done Secret Garden, Enchanted Forest, and Lost Ocean. If coloring in the lines was never your style, pull out some blank sheets of paper and try hand lettering instead. Evenings are the perfect time of day to resurrect the lost art of letter writing. Write to a family member who lives in another state or country. Write to a girlfriend you haven’t seen in a while. Write a thank you note. Make a card for a niece or nephew, complete with silly illustrations. Your letters don’t have to be long or elegant; just put your personality into it and let the recipient know that you’re thinking about them. I recommend keeping all of your letter-writing materials together in one easy-to-access spot so you won’t lose steam when you go to gather pen, paper, and stamps from the far corners of your house. Purchase a few varieties of stationary and notecards and keep them in a box with envelopes, good pens, stamps, and a hard surface to bear down on when you write. If you’ve played Settlers of Catan and Speed Scrabble to death, branch out! For a twist on a classic, try Monopoly Deal. It’s a card game that only takes about 15 minutes per round, and can be played with two people. One of my current favourites is Pandemic. It’s a co-operative game, which means that instead of trying to crush your spouse or best friend, you join forces and try to beat the game itself. Cool, right? If you want more “Euro-style” games like Settlers, try Carcassonne, Dominion, or Splendor. You usually won’t find this type of game at Wal-mart, but they’re available at sites like Amazon or We the Meeple. If hosting guests for a full meal isn’t feasible, a low-key dessert might be! You’ll have to invite someone over who doesn’t have young children, of course, but you can enjoy some grown-up time with them after your own kids are in bed. 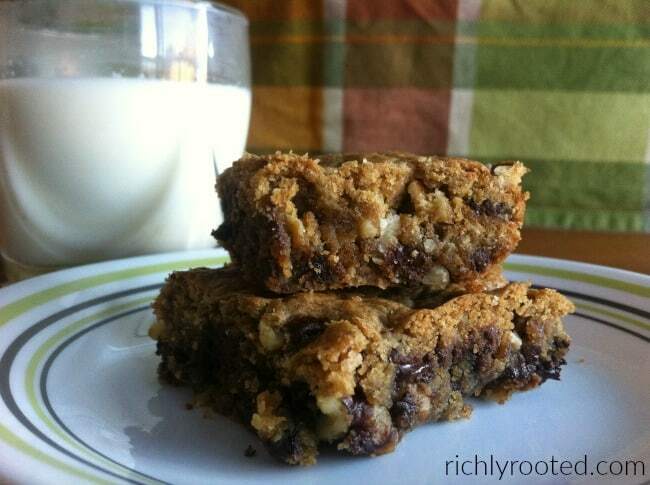 Brew a pot of decaf coffee and make a pan of gooey butter cake or thick chocolate chip cookies bars, two desserts that aren’t labor intensive but everyone loves. Don’t scroll past this one because you think you don’t have the mind for poetry! Granted, some poetry is obtuse. But much of it is less so than you think, and all poetry will communicate to you in one way or another, even if don’t fully grasp the facets of meaning in the first two or three read-throughs. And that’s part of the fun of poetry! You can read the same poem a dozen times and still discover something new. Two of my favourite poets are E. E. Cummings and John Donne, but if you’re at a loss of where to start I recommend this: go to a used bookstore, browse the poetry section, and come away with a few volumes that pique your interest. And if you’re really nervous about not enjoying poetry, Billy Collins is a safe bet. He’s a contemporary poet who writes about everyday life in funny and imaginative ways, and I’ve found his poems to be very accessible. Evenings are the best opportunity for reading because interruptions are less likely, and the afterglow of dinner is the perfect time to go several chapters deep in a new novel. Here are six suggestions that will make you fall in love with reading again. For many more book lists and suggestions, browse my literary blog, Tea and Ink Society. If you have old timey, hard-copy photo albums, flip through them on your own or with your husband and have a good laugh about how you used to dress in the 90s. If you have hundreds of digital photos to go through, spend a little time deleting and doing light organizing. This might seem like a chore at first, but soon enough you’ll get lost in the memories and you’ll enjoy reminiscing–and getting your pictures in order! Put on the kettle for a cup of tea, build a nest with blankets and pillows, and just talk with your husband. Fill each other in on what’s topmost in your thoughts these days, or discuss what you’re reading or what you want your dream house to look like. Very likely, one of the reasons you fell in love with your husband in the first place was because you found a kindred spirit in conversation. Talking is dating, and you don’t have to go out to eat to do that. 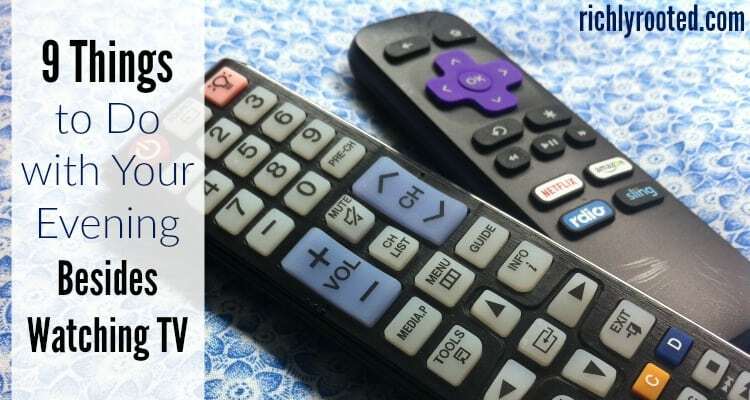 Besides cultivating yourself and your relationships, there’s another hidden benefit to pursuing alternatives to TV in the evenings. You get more sleep! I’ve discovered that if I’m not watching TV, I’m more aware of my body’s signals to go to bed. If I’m watching something, it’s easier to ignore my sleepiness and continue on in a vegetative state–until the time on the clock makes me inwardly groan! I’m not saying to cut out TV time altogether. But try watching TV less often. I’m 99% sure you won’t regret it. Actually, go ahead and make that 100%. What do you do besides watch TV? Read? Journal? Watch the stars come out? Say it in the comments below. Beautifully said. It is far too easy to give in to the siren call of the couch and Netflix these days. For a semester, we limited tv to weekends, because we just weren’t getting as much done in the evenings as we should have been. We decided to cut it down to two days a week. I really felt like I went through withdrawal (ha ha! ), but once I got through the first few days I loved it! I slept more, got my to-do list done, found more time to pamper myself (paint my nails, etc…, and life just felt slower to me. More peaceful. Less harried. As an added bonus, when we did watch a movie on the weekend it really felt like a treat! We would pick out a movie, pop popcorn, and gleefully enjoy that rare experience. That was an eye-opening experience for sure. We no longer follow the weekend-only rule, but we have been edging out tv in our lives by going on long bike rides, having friends over, and working on our individual goals (hubby composes music, and I work on my blog). Exactly–life does feel slower! And I like that feeling. Especially with summer coming up, I’m looking forward to leisurely evenings enjoying supper outdoors, or walking in the dusk. I have been learning how to weave on an inherited floor loom, and am working on my first baby wrap. After I tuck the kids in I’ll put an audio book on my wireless headphones and head to the basement for half an hour, or more, of weaving time. It’s so rhythmic and soothing! I usually fall right asleep when I’m done. Also, Librivox has free audiobooks. They are public domain books that have been narrated by volunteers, and you can find them in your podcast app by searching for a title or author. I have recently been listening to childhood favorites like Jane Austins, Little Women, and Anne of Green Gables. Just started Wuthering Heights, which I’ve always been scared to read, but why not listen while I weave? l absolutely love listening to audiobooks on Librivox.org! Karen Savage is my favorite reader, and she has done the first three Anne of Green Gables books as well as several by Jane Austen – and she changes her accent! I also enjoy listening to Focus on the Family radio broadcasts on my smartphone app. I’ll have to check out that site and narrator! What a beautiful way to spend an evening! Librivox sounds great! I will look into that! I hope you like Wuthering Heights. It’s quite an experience! It feels very raw in some ways, but it’s a beautiful novel. I just love this list! I’ve been trying to decrease the amount of TV I’m watching to have more time in the evenings to rest, relax, and also work on my website. I even wrote out all the shows we were watching and crossed out several to give up. I’ve also started coloring and hand lettering as a hobby and I try to do that for at least a few minutes each evening. That’s a good idea for a list! Seeing it on paper would make you think more about what shows are worth the time to continue or not. 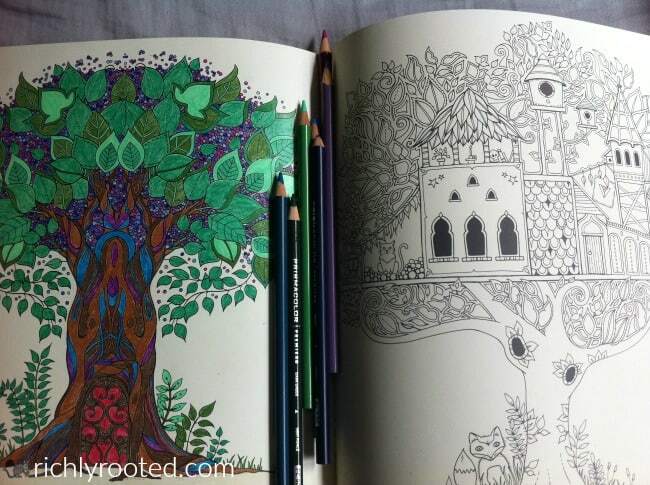 What are your favourite coloring books? My favorite quote from this post is: “Talking is dating, and you don’t have to go out to eat to do that.” I’m glad somebody understands that! I was perplexed for a while about why so much advice to married people involves having regular date nights, when my husband and I seldom go out to eat, yet we have a great marriage. The key is that we actually talk and listen while we’re at home. Thank you, Sharon! What are your favourite poets? I love this! Question though. What do you recommend if your husband prefers to watch TV, even if you’d rather do something else? We have a 7 month old daughter and he works from 5:30 AM to 6 PM most days, sometimes longer. The only time we see each other during the week is from 6-9 PM! Because he’s so tired, our “together time” usually happens in front of the TV. I enjoy it, but sometimes feel like it’s wasted time. Hi Phylicia! I’m sorry for the late response. I’ve been thinking about it, and I wonder if it would help to suggest just ONE non-TV night each week. A set night each week, maybe one where he doesn’t have to work the next day. Make it special (perhaps by including something you both love to eat). Ideally one TV-free night will turn into more…I really do think it’s something you have to help yourself get in the habit of, because it’s hard to get motivation initially. Once he consistently tries some other ways to spend time together, those things will become more appealing. Also, do you enjoy walks? If you decide for now to show love to your husband by watching more TV with him, maybe you can use a Saturday morning for a family walk–and get more talk time in! I’m in a similar boat, I find that I can do something like reading while hanging out in the lounge room with hubby while he is watching tv. If you were a crafty type you could probably do some knitting, or colouring, or something like that. Or, turn the tv off and give hubby a massage while having a little light conversation! I think you mean vegetative not vegetarian state.. I absolutely agree with all of you ladies. I also think that watching most TV programmes are a waste of time as I question myself after the programmes is over-what did I gain out of that programme? I think we need to get back to the basic of life-family. We need to spend more time with our loved ones in playing games or doing things that lift them and ourselves up. My life always seems busy with helping my children with their homework or cooking when my wife comes home late from work but in spite of all of these things we need to make everyday special somehow. Talking to your children and your spouse about their day is a very good way to keep the family together and feel loved. I have more to say but let me leave at this for now. Yes to all this! Well said. I think in general, it’s more effective to build relationships via conversation or interacting in a game, rather than watching TV together. And you usually grow and develop as a person by reading a good book more than watching TV, too. Loved this and so needed it. Thank you for your honesty and great advice. Looking for to implementing your ideas! I love those quiet morning times! There are so many interesting shows popping up that it’s hard not to get sucked in. But your efforts at creating boundaries will absolutely pay off! Also, I think anyone can become a reader…there’s hope for your husband! He may just need to try a wider variety of genres, or even start re-reading some old childhood favourites or book versions of his favourite movies. Thank you for this list, I still haven’t found my replacement for TV, but you list gave me some ideas! Awesome, I’m so glad you liked it!